So…I was thinking…wouldn’t it be a fun Zelda race study to draw myself as the different Zelda races? Tee hee!! So here comes my new series…’Hugs to my Inner Zelda!’. My first shows my Sheikah and Hylian self. 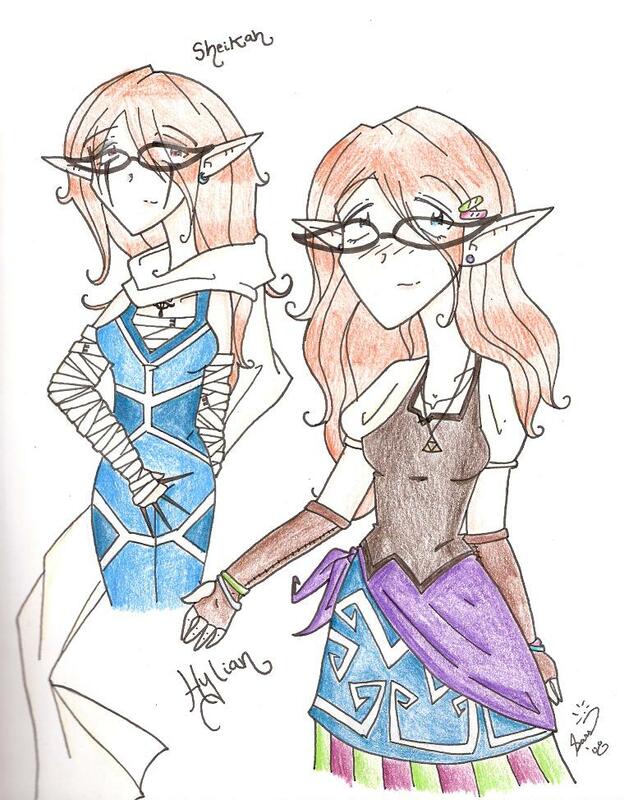 Hylian: I drew her first…and I must say…I am pleased with the results! In most Zelda games, females mostly sport a fashion on skirts…so I decided to stay true to that. (Yes there are PLENTY of examples of non skirted Hylians, but I decided to fit with a majority on this fashion). I have drawn a lot of pointed ears lately….hmm….anyhoo…I am proud of the skirts…and really….all of her. ^_^ So…hurray for Hylian me! Oh Thank you! ^_^ That makes me happy!